Landcare is fundamentally a grass roots volunteer movement supported by all three levels of government and the corporate sector in partnership with the community to facilitate community stewardship of our environment. Landcarers have a passion for seeing our natural environment managed so that it will be there for future generations to enjoy. Visit Landcare Australia for more information on the national movement. Landcarers in Lake Macquarie have an appreciation of the value of the natural areas in which we work. This includes the benefits of preserving our unique biodiversity, the importance of reducing erosion and sedimentation to the Lake, and improvements to the public amenity of our reserves, for the current, and future generations. This appreciation motivates us to volunteer our time and effort to improve and protect our environment. Many of the processes that threaten our natural environment are the result of human impacts. Landcarers strive to reverse this process by working towards the protection of our fragile habitats from unsustainable land use practices. Lake Macquarie Landcare Groups seek to restore, rehabilitate and conserve the natural environment in bushland, parks, foreshores, estuaries, wetlands, creeks, and coastal areas on Council land, Crown land, and private land of high conservation significance. Read more in the Lake Macquarie Landcare brochure. Coastcare/Dunecare groups typically help manage coastal systems. This involves the management of Bitou Bush (Chrysanthemoides monilifera), and a range of other environmental weeds, fencing of dunal “paddocks” to control inappropriate beach access and protect, to revegetate and/or regenerate coastal plant communities which stabilise the City’s beaches. 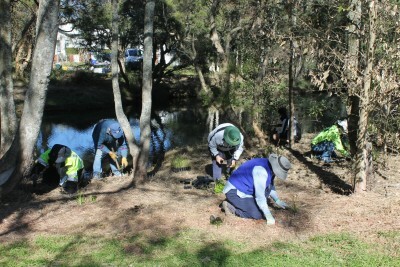 Many Landcare groups are working towards the stabilisation of the lake’s foreshore. The issues that affect its stability are over clearing, erosion and inappropriate human land uses. The efforts of these groups is often focused on revegetation of the lake edge in foreshore reserves to replace the shallow root systems of exotic grasses with the deep root systems of native species like Lomandra longifolia, Casuarina glauca, etc; and the protection of existing plant communities. These plantings provide an important environmental service by stabilizing the banks and filtering gross pollutants, sediments and nutrients from urban runoff. The great majority of Landcare groups in this city are working on remnant bushland. The primary efforts of these Landcare groups are focused on removal of exotic species like Lantana (Lantana camara), and Privet (Ligustrum spp), regeneration of the existing native plant communities, or revegetation of previously cleared reserves using locally sourced native species. These groups greatly increase biodiversity by maintaining, increasing or even creating critical habitat for our unique flora and fauna. Many of the City’s reserves include streams and drainage lines. This is largely because this land was left untouched by developers who saw little commercial value in it. Vegetation in these areas actually has an enormous value through the natural water management and filtering processes they provide. Management of these natural filters involves the removal of exotic species, many of which have minimal filtering ability, and replanting or maintaining, local native vegetation. The implementation of stormwater initiatives around the Lake has seen resources allocated to construct Stormwater Quality Improvement Devices (SQIDs) to assist these natural systems by removing gross pollutants and dissipating energy from urban drains. Landcare Groups are helping with these initiatives by planting and maintaining the catchment and other “plant filtering” components of these projects. For more information, or to make a donation please contact the Landcare Resource Centre. Subscribe to the Lake Macquarie Landcare newsletter.